First, can I say, OMG - I really am posting something other than a dang meal plan. Yay! Maybe 2014 will provide a little blogging time. 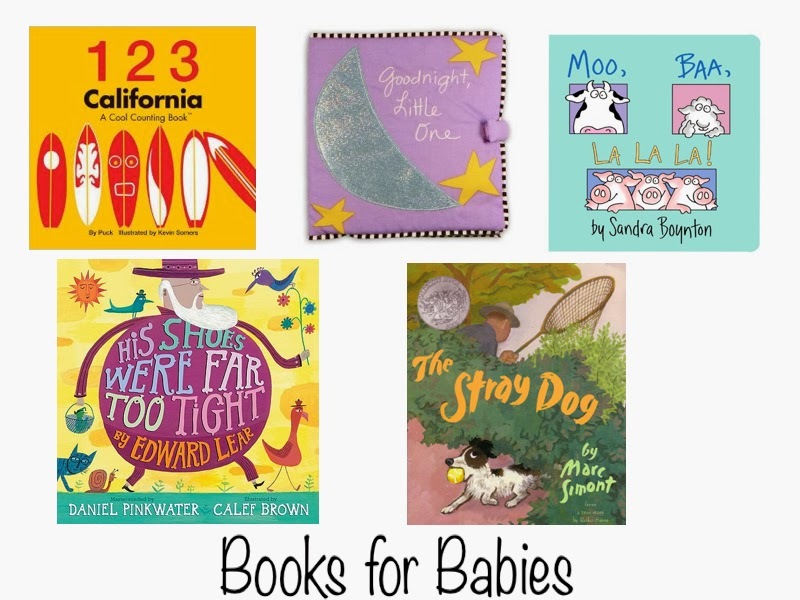 I really wanted to do a post about books for babies, because little Lucille loves books - albeit mostly for chewing. Here are five favorites in our house. 1. 123 California - This book was a gift from my great aunt. Its simple and bright and we both like it. And in case you wondered, its author is NOT the same "Puck" as "The Real World" star. 2.) Goodnight, Little One - This is a cloth book that Lucille loves to play with on her own. We don't really read it, but she wraps herself up in it and loves the flaps to flip up. Oh, and we let her chew on it. 3.) Moo, Ba, La La La - Lucille likes turning the pages in books and sometimes doesn't really give you enough time to read the words. This book we all had memorized after one or two readings so that's no problem. All Sandra Boynton books are like that. 4.) His Shoes Were Far Too Tight - This book is one that you might have to hold away from your baby or only read to them when they have a pacifier or something to stop them from wanting to rip the pages and eat them. The poems in this book are wonderfully silly though, and perfect for little ears. 5.) The Stray Dog - This book was given to us by a friend who said it was a favorite of her boys. Jonny likes reading this one to Lucille before bed sometimes and again its one she listens to. Because its not really a "baby book" I think she'll like it for a long time to come. P.S. I tried to think outside the box here. I must say though, she loves Goodnight Moon and actually (mostly) lets me read the whole thing.